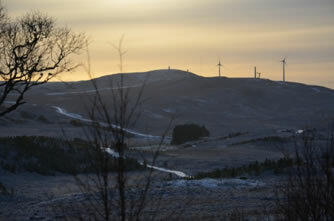 Here is a picture from December 2nd – two turbines now complete. Turbines to be delivered very shortly – watch out for the blades!! 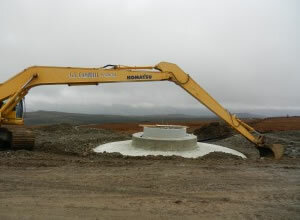 The first of the five turbines is due to be delivered the week of October 15th. The dates have been changing and are now due to be Wednesday 17th, Thursday 18thm and Friday 19th October. Wednesday will be the hub, nacelle and generator, Thursday will be the three tower sections and Friday will be the blades (each blade will be an abnormal length load) – probably in the morning. The route will be along the A82 via Drumnadrochit and then up the A831 to Corrimony. 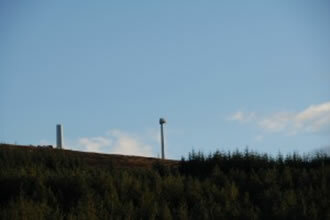 The timing of the transit of the other four turbines from Inverness is not yet known as it will depend on the weather on site. However the notice at the entrance to the Corrimony Windfarm site states “For information on what day of each week the large movement of lorries will occur, please phone 07810 180256).” However they will only know at the end of the week what the situation will be for the following one. We will post updates we receive on this web page. During a break in construction, today (Saturday 29th September) saw the burial of three time capsules at a ceremony on the site of a new wind-farm at Corrimony, Glen Urquhart. 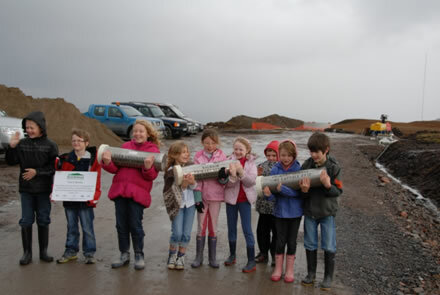 The 2’ long capsules, manufactured and donated by Isleburn (part of the Global Energy Group), have been filled by pupils from Cannich Bridge, Balnain and Glen Urquhart Primary Schools and will remain buried until 2037, when the wind farm is due to be decommissioned. The next Soirbheas board meeting, to which all members are welcome, will be on Friday 28th September at 7pm at Balnain Hall. The construction of the windfarm is progressing well so Mike Girvan will be giving a status update on the project. Act now – insulation grants ending in December – broad eligibility criteria currently!! The current CERT funding for cavity wall and loft insulation will be ending on 31st December 2012. Grants for cavity wall and loft insulation are currently available to EVERYONE (excluding local authority tenants) who would like to have their home insulated – but residents must act quickly in order to take advantage of this offer. ILM Highland has been insulating properties across the Scottish Highlands for over 15 years and are a local not-for-profit organisation based in Alness. All of their staff involved in energy efficiency are highly trained and experienced and hold all of the necessary certification and memberships relating to insulation (NIA, BBA and CIGA), which are rigorously checked by independent external inspectors. Please note that the current offer is advertised on their website www.ilmhighland.co.uk if you want more information. They have told Soirbheas that their team will ensure that each enquiry from every customer receives the best possible service and most appropriate grant offer relevant to their circumstances. ILM has access to a wide range of grants from a number of schemes, and they are therefore well placed to provide the genuine best deal for each customer. Their contact details are: ILM Highland – Insulation Service Tel: 01349 884774 Email: energy@ilmhighland.co.uk Web: http://www.ilmhighland.co.uk. Given Soirbheas’ wants to improve the energy efficiency of homes in the area, please would you share this information as widely as possible to enable as many people as possible to benefit from this grant offer while it still lasts. The CERT funding for loft and cavity wall insulation WILL be ending on 31st December 2012. The Green Deal will emerge in its place – although this scheme will operate on a loan basis and is not a grant. Community Energy Scotland and the National Farmers Union of Scotland visited Corrimony Windfarm on Friday 17th August to learn more about the experience both Corrimony Energy and Soirbheas went through to reach the novel structure agreed and the future plans. Thank you to the Girvans for hosting the visit. With the rollout of superfast broadband across the Highlands and Islands looking set to begin next year, the region’s development agency is launching a public consultation on current levels of service. So HIE is seeking feedback from residents and businesses about the accuracy of its coverage maps in Appendix A of the consultation document and, in particular, the accuracy of where there is currently basic broadband performance. Tanya Castell and Erik Trelfer attended a seminar on Wednesday 30th May organised by the Scottish Community Foundation, Highlands and Islands Enterprise and in partnership with Scottish Hydro, Development Trusts Association Scotland, Social Enterprise Academy and Community Energy Scotland to share knowledge, discuss issues and get inspired around the topic of how to invest in the community. A wealth of experience is building up within Highland communities around implementing community benefit/investment from renewables. This experience is a rich resource for ensuring that the unprecedented levels of anticipated ‘benefit’ have real impact. Building on current momentum, the seminar was for communities, agencies and developers to share practice and learning about some of the practical ways community benefit/investment funds are being implemented locally and the impact being achieved for communities. It covered a range of issues including governance, community engagement and consultation, leadership and partnerships. On Friday May 25th, Soirbheas and Corrimony Energy completed the financing of the Corrimony Windfarm which will allow the project to proceed. 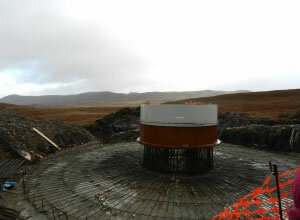 The five turbines should be in place by the end of this year and connected in early 2013. Soirbheas will receive a fifth of the profits, equivalent to owning a turbine, with money available to invest in local community projects from 2014. More information on the innovative approach will follow. Thanks must go to the Girvan family for their commitment to sharing the benefits of this project with the community. Additionally thanks are due to the Big Lottery Fund, Community Energy Scotland and Highland Council for their support to help us reach this point and to Social Investment Scotland for providing the funding to enable Soirbheas to be part of this project. Soirbheas and Corrimony Energy are hoping to finalise the financing of the whole project in the next few weeks so this is a crucial phase. All members (and prospective members) welcome To Thursday’s meeting at Blairbeg Hall, Drumnadrochit – Soirbheas is also keen to involve more people from the community so please come along or contact us if you are interested. On Saturday March 24th, Soirbheas attended the HEN conference in Drumnadrochit. There were a number of talks and some interesting workshops including ones on tackling fuel poverty and using thermal imaging cameras to assess where houses are losing most heat. Tanya Castell, Chair of Soirbheas, attended the Cross Party Group on Rural Policy discussion at Holyrood on Wednesday 7th March on a low carbon rural economy. This provided a number of ideas on how Soirbheas could meet its objectives once the windfarm is generating income for the community. Tanya Castell, Chair of Soirbheas, attended a Community Energy Scotland (CES) workshop in Stornoway on February 23rd/24th along with representatives from 5 other windfarm community trusts (all from the Western Isles) all of which are hoping to have their turbines connected in the next 12 months. The aim was to increase awareness of different procedures and methods of spending the income earned. * To be equipped to ask the right questions and develop criteria and spending method. * To identify the different procedures that could be adopted. * To develop an application form for application to the charity’s income. * To identify who will be eligible and what the criteria will be. A summary of the discussions is to be produced by CES. On Thursday February 9th, three Soirbheas board members along with Soirbheas’ lawyers, Davidson Chalmers, met in Edinburgh with Coop Bank and their lawyers, Brodies, and Corrimony Energy and their lawyers, WJM, and Social Investment Scotland and their lawyers, Morton Fraser, to discuss the financing structure. There was a constructive discussion and we are now waiting for an updated proposal from the bank. Soirbheas has been awarded £4,000 from the Highland Council Aird and Loch Ness Discretionary Budget to assist the charity in the purchase of its wind turbine. This is a much appreciated addition to the equity funding of the project given the significant costs involved. Thank you very much to those involved. The Scottish Government has launched a new website (www.greenerscotland.org/welcome) aimed at helping people in Scotland go greener together. The Greener Scotland website has advice, information and resources to help you reuse and recycle, save energy, eat more seasonally and more. You can also create your own Greener Plan, sign up for updates and follow @Greener2gethr on Twitter. Find out more in New website to help Scotland to go greener together. The second meeting of the Cross Party Group in the Scottish Parliament on Rural Policy was held in December. The meeting focused on the issue of rural broadband. Two speakers – Stuart Robertson from Highlands and Islands Enterprise and Duncan Nisbet from the South of Scotland Aliance – presented jointly on “Next Generation Broadband: South of Scotland and Highlands and Islands. Here is the link to the slides – Next Generation Broadband slides (PDF) and minutes can be found on the SAC website.